I have had the rattle/ buzzing noise in my driver side door for a few years, but really wanna fix it now. I took it apart a while back and glue-gunned all the foam pieces, but can't find the real culprit. Anyone know how to fix this? It's VERY annoying every time I hit a bump in the road. Thanks for the tips on fixing the side mirror top rattles. My driver's has been bothering me for awhile. Rattles over bumps and when I close the door. Ok so I am now experiencing the rear windows rattle everyone else had a few years ago, but now since most of us are out of warranty, am I SOL for getting the dealer to replace the window sill for free? Anyone figure out the tapping on glass rear windshield noise? Felt so good to get rid of my rattling problem that I had to tell all of you awesome folks here. Oh, and I am new, so don't mind my craziness. Anyways, after installing the Audio IN interface device, the head unit area started to rattle and creak every time I go over rough surfaces and rocks etc. It got louder and louder every day. The dude at the shop bent the plastic parts, squeezed foam in some areas but to no avail until he used some velcro thingies (any kind of similar should work too). This is how he did it. Hope it helps!! Except for the damn lousy fuel efficiency. 1. Sunroof rattle generally only when sunroof closed, but the sun shade open. 2. Rattle occurs or only audible at lower speeds around 25-30mph. 3. Rattle stops when applying downward pressure in the center top edge of sunroof frame opening. 2. Open sunshade and sunroof. 3. By hand gently pull away sun roof opening edge trim to expose headliner edge. 4. 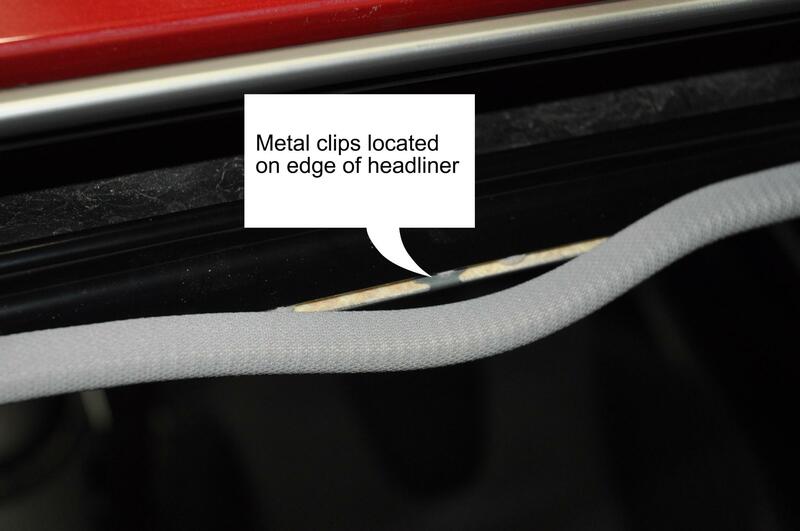 You'll notice metal clips that are spaced along the edge of the headliner. 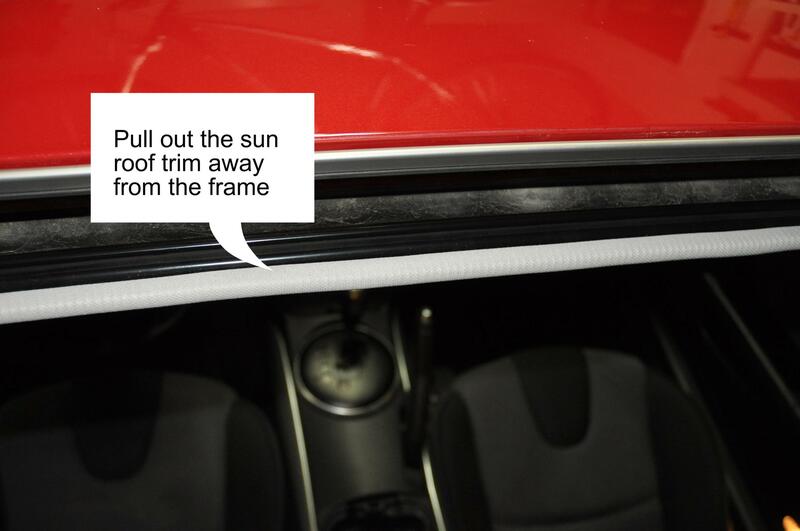 Pull the edge trim far enough away to expose all the metal tabs along the headliner in the front of the opening. 5. 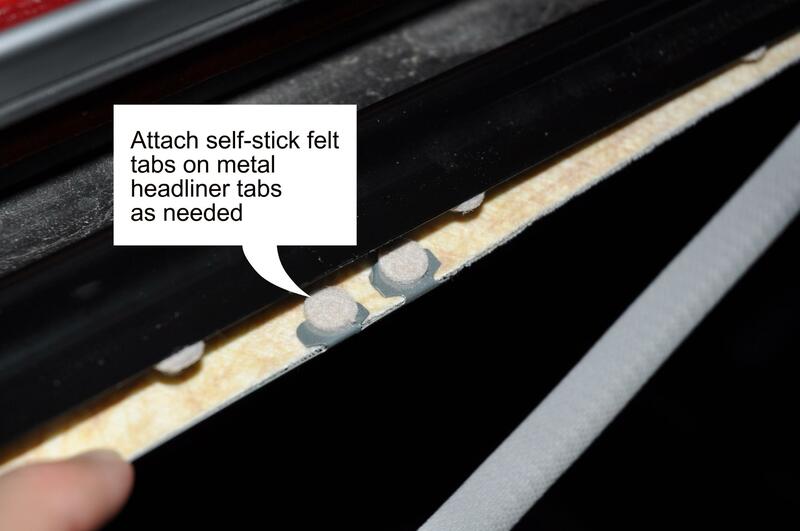 Gently pull the headliner down away from the sunroof frame and apply self-stick tabs on top of each of the metal tabs. This will prevent the metal tabs from vibrating against frame when driving. I added extra felt tabs along the length of the front side of the sunroof frame just in case. 6. Reattach the sunroof edge trim. I have a very annoying rattle coming from my glove box. It rattles at all times when the engine is on. I have added bushings and dampeners to where the hinges meet and the leading edges. Problem was not solved. I removed my whole glove box and took the handle/lock out. knocked on the box itself and it rattles. Apparently the glove box is two pieces of plastic molded together, or at least clipped together. The right side is rattling. There is foreign object that is in it either. I'm trying to take the box apart as I type this. Last edited by SayNoToPistons; 11-22-2012 at 04:00 PM. Seems like it can't be taken apart without cracking both pieces from the mold seam... I'm afraid I might risk breaking the entire thing. I might consider drilling a few holes into the glove box in an inconspicuous area and filling the inside with foam insulation to isolate the resonance. That's the only feasible way to stop the rattle without replacing the glove box. I don't see much use in replacing the whole glove box either since it is simply a failed design to begin with. So I've seen a few posts mention the dash rattle from the left hand side of the steering wheel/ the driver side air vent/the change tray to the left of the wheel/the TC button area. Mine has recently become really loud and almost continuous. If I press on any part of that left area it stops I guess because I'm stopping the dash vibration causing that rattle. Anyone know what is actually rattling here? I'm going to have a go at taking things apart this weekend. I've already done the instrument pod fix. This one drives me nuts when the weather starts going below 40F. Usually raising the steering wheel, then adjusting it again will shut it up for a drive. I can't wait for warmer weather already. Well it's warm here now and that has not helped. Interestingly, thumping it does seem to help some for a short while. I also ran some different tires for a weekend. That fixed it completely, but brought on a center console / radio area rattle. Back on the original tires, I'm back to the same rattle. I guess different tires vibrate at different frequencies and so excite different parts of this car! Okay. I have read most of the entries in this thread, but haven't seen the problem that I have in my 2006 RX 8. There is an extremely annoying plastic-y sounding rattle in the trim piece that surrounds the map lights and moon roof controls. If I push on the trim piece the rattle disappears. As soon as I stop pushing on it, the rattle is back. I don't see any way to tighten the piece. I have wedged coins in between the trim and the roof, but that has not helped. It makes me a little crazy!! This is a little OCD, but I can't stand to hear the contents of my glovebox rattling. Since the glovebox is made up of cheap thin plastic, anything like pens, metal tire gauges, flashlights, coins etc will often rattle. Also, hard cornering induces annoying sliding/scraping sounds of whatever is in the glovebox. I originally solved this by cutting some thermotec insulation material to provide a padding to minimize rattling and sliding. It worked perfectly, but I was never satisfied with how it looked. So I took it out and ended up using Plasti-Dip to coat the inside of the glovebox. This was incredibly easy, and looks totally professional. I got the black spray paint can at Lowes for around $5 (1 is more than enough), and just taped off the edges with masking tape and news paper to deal with overspray. I did 5 light coats approximately 25 minutes apart. Now the inside of my glovebox has a nice grippy padded surface. Works perfectly and really easy to do. Old post but I can't find anywhere that will give me a solution.anyone linked to the post still? I'd appreciate help. 2005 192 black and red leather seats. Behind the back rest for the passenger and where the rear passengers knees would be there seems to be an irritating squeek and rattling noise coming from inside the seat when no one is sat there and roads and slightly bumpy. If definitely inside the seat (just slightly above where the seatbelt connector is in the middle side). It's a plastic casing to the back of the seat, can this be easily removed? I'm guessing metal inside the seat is rubbing? I've been having this problem ever since winter, I gather. When the temperature outside is around fifty and under, there is a soul-wrenching squeak that happens on the deck behind the passenger side back seat. Anyone else have this issue, or know how to fix it?